Blogger Challenge & a Giveaway! In my last post I was blogging about a local creative event called #SaintJohnCut4 in which I teamed up with models, photographers, and clothing retailers to produce a series of photographs. This photo came from the #SaintJohnCut4 sessions. 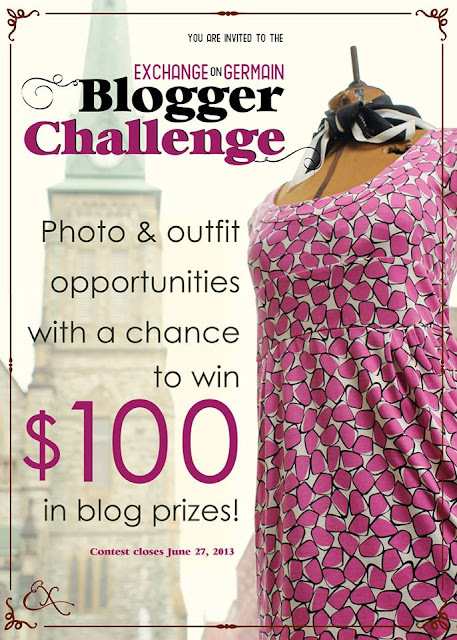 One of those retailers, Exchange on Germain, is doing a blogger challenge with local bloggers and I'm so happy to be a part of it! Yesterday I went into their lovely shop and put together an entire outfit (I'm talking clothes and accessories!) for under $100. I will be posting the outfit picture on my blog but the real contest takes place at the Exchange on Germain facebook page. June 16th they will post a Blogger Challenge facebook album where you can vote on the best outfit. The winning blogger gets a $50 gift certificate to give away on their blog and one to use for themself! Such a fabulous idea! Vote HERE for my picture by liking it on facebook. Be sure to leave a comment on THIS post, telling my your best shopping find. How exciting! Can't wait for the links. Glad you fixed your blog and it didn't die forever. thanks! I have a tech savvy friend that I'm going to ask for some help. I have the rights to my original domain but can't change the settings so I'm going to see if he can direct both to this site...I'm paying for it and it's what everyone has, so I'd like to keep it! Hair News and a Party!